Monarch Butterfly. Photo courtesy of the Center for Food Safety. It’s National Pollinator Week, meaning it’s time to take a moment to recognize some of the smallest and most important contributors to agriculture. Over 70 percent of crops, from almonds to clover to squash are dependent on insect pollination. While we are all familiar with honey bees as pollinators, thousands of other insects are involved, including butterflies, beetles, and native bees. In the U.S. alone there are over 4,000 species of native bees that contribute heavily to agricultural production. Annually, insect pollination contributes $20-40 billion to U.S. agriculture, and a recently published study indicates that an abundant variety of bee species can lead to greater yields in crops like blueberries. Unfortunately, in the past decade honey bees and many other native pollinator species have been in decline, due in part to pesticide overuse and loss of habitat. Given the key role of all pollinators in successful crop production, all farmers need to be aware of how their agricultural practices effect pollinators. For young and beginning farmers, helping pollinators thrive on the farm may not be topping to-do lists, but there are several easy ways for small farmers to encourage pollinators. For many of you already practicing sustainable farming techniques, you may already be implementing important steps like growing a diverse range of crops and reducing your use of pesticides, especially a class of pesticides called neonicotinoids, which are highly toxic to bees and other insects. Supplying habitat is perhaps the easiest contribution young and beginning farmers can make to supporting pollinator health and productivity. Each region of the country has its own unique flora that is attractive to both domesticated bees and native pollinators. Learn about the flowers, grasses, and weeds native to your area that attract pollinators and consider growing them around your barns and in buffer strips around your fields. 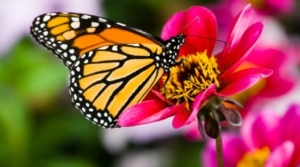 For example, milkweed grows throughout most of the country and is an invaluable food source for the Monarch butterfly, and in the Northeast, goldenrod is loved by honey bees and native bees alike. It can also be very helpful to pollinators to supply them with housing. Most species of native bees throughout the country are solitary, meaning that they do not mimic the hive structure of domesticated honey bees. While they may live with other members of their species in, for example, a hollowed-out log or abandoned rodent dens, they each have their own individual pocket within the structure which they do not share. 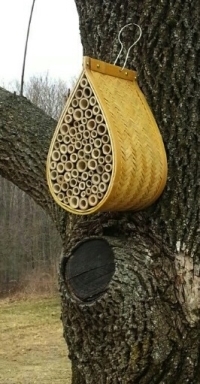 But native bees will also use man made habitats easily made with plastic tubing or purchased relatively inexpensively and attached to trees or barn siding. Most of these bee houses can be reused year after year. You may also consider allowing a small commercial beekeeper to use your land to temporarily house their bees. On my family’s property in upstate New York, a local bee keeper drops off his hives from late summer to mid-fall; using our land in exchange for a crate of honey. The bees gorge on clover, hay, goldenrod, crab apples, and wildflowers before being loaded up and taken to Florida for the winter. These are only a few examples of how even the smallest farmers can encourage pollinators to thrive…and be present to pollinate their crops. During this National Pollinator Week, look around as you go about your daily chores. Those bees, butterflies, and beetles you see are working right alongside you, participating in the success of your farm.